Hold on to those lovely old Chinese rice bowls and porcelain. Some of those we have recently been given are worth affair bit more than you may think and the more unusual or rare ones will fetch a lot lot more – should you wish to part with them. In March 2013 a 1,000-year-old Chinese bowl bought for a few dollars at a garage sale in New York state sold for more than $2.2 million at a Sotheby’s auction. Said to be a "Ding" bowl, which is from the Northern Song Dynasty, and measures just over five inches (12.7 cm) in diameter, for which no more than $3 was paid in 2007 and displayed it on a mantelpiece with no idea as to its real worth, Sotheby's said. The only known bowl of the same form, size and almost identical decoration has been in the collection of the British Museum in London for more than 60 years. Then in April 2013 another rice bowl fetched $9 million – setting the world record for Qing ceramics from the Emperor Kangxi era, as wealthy Chinese collectors are showing interest for Chinese antiques and fine works of art. The Falangcai 'Double-Lotus' bowl is from the 1662 to 1722 era. It's the only bowl recorded with this design and it typifies one of the earliest pieces decorated in the newly introduced Western enameling technique. It has a stunning ‘raspberry’ colour and a pattern of a continuous lotus pond landscape—lotus blooms in yellow, blue, pink, and white hues—with single and double flower heads on delicate stems. "It's a very special bowl, very exclusive. The last two, three pieces that have appeared in the last 10 years were not in perfect condition. This is in absolute mint condition, which is very unusual for this type. And the decoration is particularly pleasing. It's got the design, as you can see, of the double lotuses. Not single lotuses, double lotuses, which is the sign of a very auspicious reign for an emperor." Nicholas Chow, Sotheby's Asia Deputy Chairman stated. Traditional Chinese rice bowls measure 4 ½ inches or close to 12 centimetres around their rims. In Japanese culture the rice bowl was, anciently, designed to fit perfectly in the user’s hand. The 12 centimeter diameter of a rice bowl is derived from the average diameter of a Japanese person’s hand when a half-circle is made with the thumb and pointing finger. In other words, it is the perfect size that naturally fits in the hands of the user. The height is set at half the diameter, which is 6 centimeters. The ratio between the pointing finger and thumb is said to be exactly 2:1, and this ratio does not change in any configuration of the hand. Some state that this ratio creates the ideal relationship between the hand and the rice bowl. 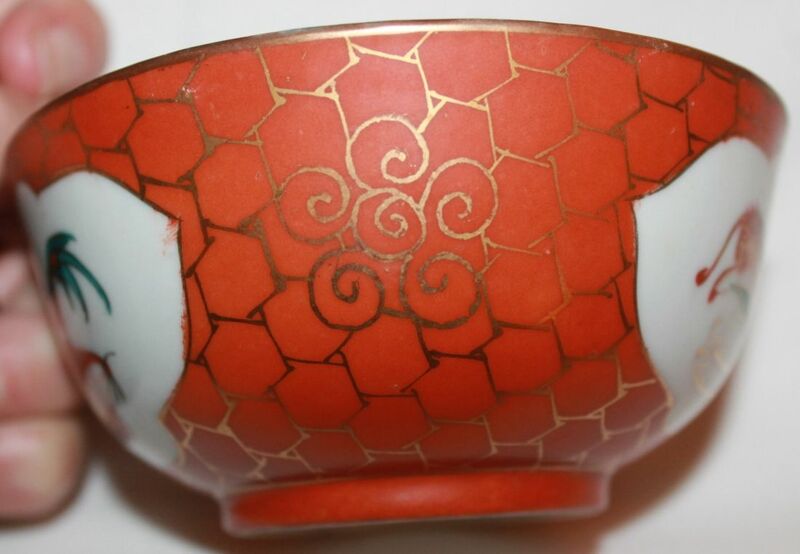 In ancient times, the “Wan” bowl used to be called “Mari” (old Japanese term for ‘ball’). The name is said to derive from the spherical shape of the bowl being denotative of a ball. Aside from the variations with differing shapes, the ‘ideal bowl’ is said to be one that creates a 4-sun (12 centimeter) sphere when two bowls are cupped together. This 12-centimeter (4-sun) diameter is the common standard even amongst the multiple regions across Japan. The measurement units such as “sun” that are embedded in the ancient history of Japan derive from measurements and proportions of the human body, collectively known as “Shindoshaku”. With so much interchange of knowledge and culture between Japan and China from earliest times, and with ancient China leading the world for centuries in health and body functions and proportions, it seems likely this too is a transference of ancient knowledge that may indicate why rice bowls are the size they are. A remarkable record has just been achieved by the NSW Water Conservation and Irrigation Commission in the preparation, ditching, ploughing, sowing and irrigating of 5,000acres of rice land in a matter of six months, wrote the "Land," Sydney, on October 29. Mr W. Rawlings, the Rice Commissioner, said this week that work began on the area in April, and a definite schedule was laid down to be completed by July 29. The big team of men engaged on the job actually completed the schedule by July 28. This, probably the world's largest .rice farm, was put under crop at the request of the Commonwealth authorities to meet the huge demand for rice from the islands and the civil population-at home. Six million movie-going Australians had been fed on a screen diet of glamorous success stories from America and Europe but had never seen one of their own nation's greatest developments. This comment was made by Major General Sir Kingsley Norris on the conclusion of a visit to Murrumbidgee Irrigation Areas. Sir Kingsley recently, returned from a special mission overseas associated with the recruitment of scientific personnel and during an intensive three-day inspection of the irrigation areas met many overseas scientists. 'Enterprise, initiative and confidence in the future displayed by M.I.A. people regarding their industries, their area and their ability to grow is an example to Australia'-' Sir Kingsley declared. 'It is surely time that the people and the industries concerned got together to ensure that this success story is told everywhere in Australia. A film for distribution at home and abroad is a prime need if people are to know what has been achieved. 'I don't know why it has not been done before but I strongly recommend this project be followed up now,' Sir Kingsley added. A ‘Rice Bowl’ Area is a term used to define a place where rice grows plentifully. There is a Chinese proverb that goes, "without rice, even the cleverest housewife cannot cook." Rice is synonymous with China-rice cultivation goes back at least three to four thousand years. It is part of China's culture, history and heritage, much like potatoes are to Ireland. The word for rice in Chinese is the same as the word for food. "Iron rice bowl" (simplified Chinese: traditional Chinese: pinyin: tiě fàn wǎn) is a Chinese term used to refer to an occupation with guaranteed job security, as well as steady income and benefits. The Chinese term can be compared to the similar (but not identical) English concept of a "job for life". Traditionally, people considered to have iron rice bowls include military personnel, members of the civil service, as well as employees of various state run enterprises (through the mechanism of the work unit). Because the "Iron Rice Bowl" guaranteed a stable standard of living regardless of the amount of effort made by the worker, the term is also used to describe extremely unmotivated and unproductive workers. There have been plenty of debates on the origins of the domesticated rice. Genetic evidence published in the Proceedings of the National Academy of Sciences of the United States of America (PNAS) shows that all forms of Asian rice, both indica andjaponica, spring from a single domestication that occurred 8,200–13,500 years ago in China of the wild rice Oryza rufipogon. A 2012 study published in Nature, through a map of rice genome variation, indicated that the domestication of rice occurred in the Pearl River valley region of China based on the genetic evidence. From East Asia, rice was spread to South and Southeast Asia. Before this research, the commonly accepted view, based on archaeological evidence, is that rice was first domesticated in the region of the Yangtze River valley in China. Porcelain can informally be referred to as china or fine china, as China was the birthplace of porcelain making. Although proto-porcelain wares exist dating from the Shang Dynasty (1600–1046 BC), by the time of the Eastern Han Dynasty period (206 BC – 220 AD), glazed ceramic wares had developed into porcelain. Porcelain manufactured during the Tang Dynasty (618–907 AD) was exported to the Islamic world, where it was highly prized. Early porcelain of this type includes the tri-colour glazed porcelain, or sancai wares. There is no precise date to separate the production of proto-porcelain from that of porcelain. Porcelain items in the sense that we know them today could be found in the Tang Dynasty, and archaeological finds have pushed the dates back to as early as the Han Dynasty (206 BC – 220 AD). By the Sui Dynasty (581–618 AD) and Tang Dynasty (618–907 AD), porcelain was widely produced. 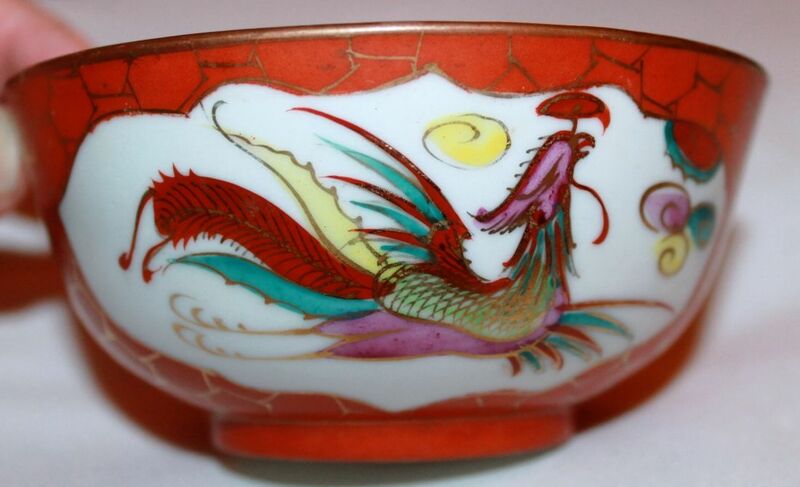 Bowls, such as those shown in the photographs here, with dragons, phoenixes, gourds, and characters, are for happiness. This one has brought much happiness to our family as it can be traced to a certain engagement, on a certain evening dinner, and bought from the owner of that restaurant on that evening - so we can state emphatically it is at least 55 years old. With Chinese porcelain, as with all porcelain, the way to determine who may have made it and where and when it was made is to look at the base and the makers marks. The numbers shown here refer to a factory and indicate one of these was made mid 1950's and the others, with the wider gold brim, were made during the 1960's in the vicinity of Jingdezhen and are Jingdezhen ware. Jingdezhen ware refers to ceramics, particularly porcelain, produced in the vicinity of Jingdezhen, China. Jingdezhen is believed to have produced pottery as early as the sixth century CE. According to the Chinese historical records, Jingdezhen has a history of making porcelain for 2000 years since Han Dynasty. Jingdezhen is known as the “town of porcelain” and is not merely famous for its porcelain making; the more important is the porcelain it produced enjoys great prestige in the whole world. In around 1953 to 54, almost all the factories in Jiangxi were merged into larger units, each made up by ten to fifteen previously independent factories. From this time factory numbers such as =9= came to be used. The use of alphabetic characters and numbers in the marks also seems to have started around this time. Long time porcelain merchant in Hong Kong, Mr. Kung, was when asked by Simon Ng on this, of the opinion that =09= and similar, were names assigned to each of the factories in Jingdezhen by the Communist Party. These were bought a little later than the engagement rice bowl and, as they have never been in the grip of 'little fingers' there are no chips, no scratches, and none missing from the set. Our research showed people are currently asking around $100.00 for a pair of these with only traces of gold rims - not the wider bands shown on these. The plates that match this set, of fine china, are being sought for $30 to $50 as single items. On both sets of bowls a phoenix is one side and a dragon on the other. Fenghuang (traditional Chinese: pinyin: fènghuáng) are mythological birds of East Asia that reign over all other birds. The males were originally called feng and the females huang but such a distinction of gender is often no longer made and they are blurred into a single feminine entity so that the bird can be paired with the Chinese dragon, which is deemed male - so they are in a way 'marriage bowls' - even when the receptacle where rice and food eaten with it mix. Images of an ancient bird have appeared in China for over 8000 years, as earliest as the Hongshan neolithic period,[ on jade and pottery motifs, then appearing decorating bronze as well as jade figurines. Some believe they may have been a good-luck totem among eastern tribes of ancient China. During the Han Dynasty (2,200 years ago) two phoenixes, one a male (feng) and the other a female (huang) were often shown together facing one other. Later, during the Yuan Dynasty the two terms were merged to become fenghuang, but the "King of Birds" came to symbolize the empress when paired with a dragon as a dragon represented the emperor. The phoenix represented power sent from the heavens to the Empress. If a phoenix was used to decorate a house it symbolized that loyalty and honesty were in the people that lived there. Or alternatively, a phoenix only stays when the ruler is without darkness and corruption. The fenghuang has very positive connotations. It is a symbol of high virtue and grace. The fenghuang also symbolizes the union of yin and yang. Shan Hai Jing's 1st chapter “Nanshang Jing” records each part of fenghuang's body symbolizes a word, the head represents virtue, the wing represents duty, the back represents propriety, the abdomen says credibility and the chest represents mercy. In ancient and modern Chinese culture, they can often be found in the decorations for weddings or royalty, along with dragons. This is because the Chinese considered the dragon and phoenix symbolic of blissful relations between husband and wife, another common yin and yang metaphor. In some traditions it appears in good times but hides during times of trouble, while in other traditions it appeared only to mark the beginning of a new era. In China and Japan it was a symbol of the imperial house, and it represented "fire, the sun, justice, obedience, and fidelity" (5). The other unusual item here - we'll save some of the Japanese porcelain collection for another page, are these Chinese spoons, Chinese soup spoons, or duck spoons, as they have the little ceramic 'rests' you may not find on similar items today. These too are definitely in their 'middle age'. So if you're thinking those unusual and 50-60 year old rice bowls and accouterments could use an update - think again. These everyday items are beautiful, have a long historical precedent and family story - something that should be handed on again, to the next generation, when those newest little fingers are not so small, grubby or clumsy. These are bowls of love - and indicate a marriage - and all who came after that era when our parents were clearly seeking new tastes in food and culture, during the Fabulous Fifties, while also picking up knowledge to hand to us literally with a bowl of rice, can think about now and then, and perhaps finally inkle all our mums and dads had their own moments of being, and remaining still, very very cool. Those found to match and double then double then Double the Happiness again. 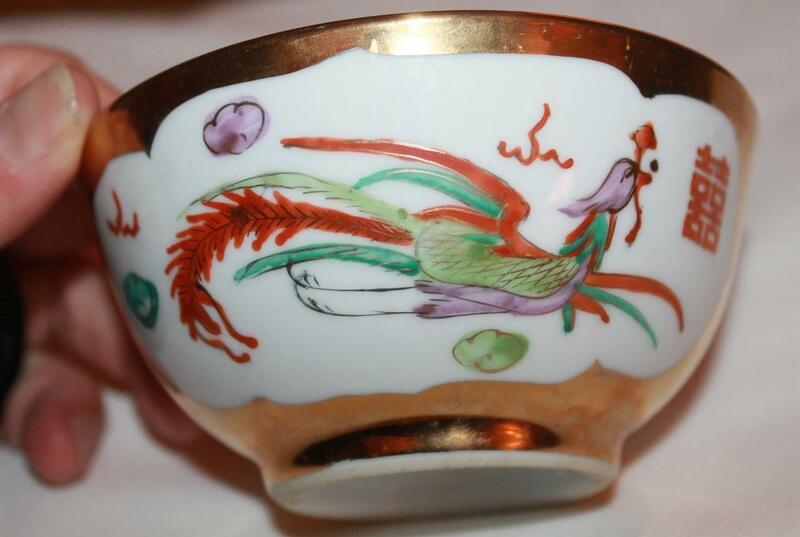 Old Chinese Rice Bowls for Marriage: Worth More Than You Think… - article by A J Guesdon, 2015.